Most 17 year olds are attending school and will soon write their matric exam, even if not all of them pass. Right? No! By the time a class of 30 children reaches grade 12, 50% of their peers have already left school without even making it to the grade where their can write matric. This means that ‘1 in 2’ young people don’t have a recognised school-leaving qualification that will enable them to access important future opportunities. They cannot go to university. They are less likely to be invited to job interviews. And they will probably be excluded from youth development programmes, many of which have a matric as their minimum entry requirement. The funnel of opportunity narrows the earlier they leave school. While there are some options for learners who exit at grade 9 (such as completing certain NCV or NATED courses at college, or accessing learnerships and skills programmes), these options are often not sufficiently appealing to young people. As a result they struggle to obtain further educational qualifications. Employers are reluctant to hire someone with only a matric. They are even more reluctant if this is a grade 9. The story of school dropout is a story of slow and steady disengagement from education over a long period of time that is driven by multiple factors. And it has massive consequences for our society. Its culmination might be grade 12 but its roots are far deeper. 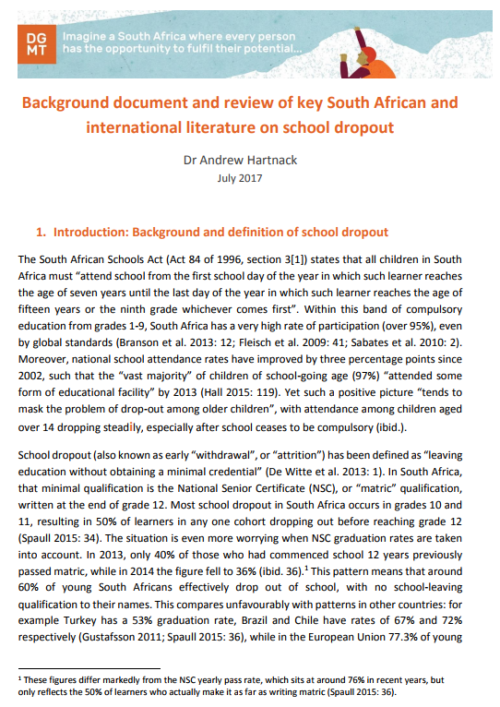 DGMT commissioned Dr. Andrew Hartnack to review the literature and disentangle the many causes of school dropout which cut across individual, family, school and policy levels. The review also explores some of the possible interventions and approaches for addressing the problem. We have included a summary of the key facts in a table at the end. In the noise that inevitably accompanies our matric pass rates, an equally important issue is being overlooked. We hope this document will spark new or increased interest in the issue of very high levels of school dropout, deepen understanding of its causes and mobilise support for addressing it.